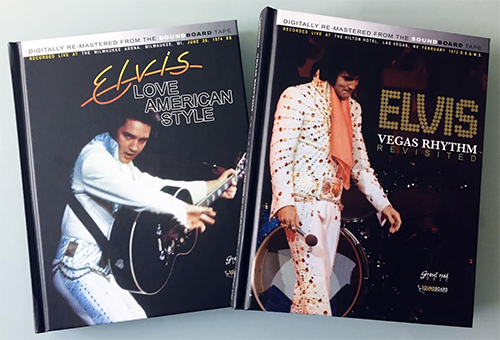 BRANDNEW -Deluxe 100+ pages book with Soundboard CD “ELVIS, LOVE AMERICAN STYLE” featuring the 28th June, 1974 concert. AND the BRANDNEW “ELVIS, VEGAS RHYTHM REVISITED” featuring the February 3rd, 1973 Dinner show. also a Deluxe 110+ pages book with Soundboard CD Including a Multi Media DVD with in full format 2 extra shows February 2nd, Midnight Show and February 3rd, 1973 Midnight Show and 45 Minutes 8 mm footage of the January/ February Vegas Season. Also looking forward to them..but more to the books...I take the discs as extras anyway..
Gottem! Looks marvelous on first sight!